MANILA -- Authorities from the Office of Transportation Security (OTS) and the Manila International Airport Authority (MIAA) are conducting further investigation on the alleged theft involving an X-ray operator at the Ninoy Aquino International Airport (NAIA). AIRPORT THEFT. MIAA Intelligence and Investigation Division Inspector Erick Mejia (right) accosts airport x-ray operator Nievel Gorpe (left), who figured in an alleged theft incident last Aug. 30. Airport authorities are now probing the incident. Mejia also arrested Gorpe last Sept. 1 for unjust vexation. 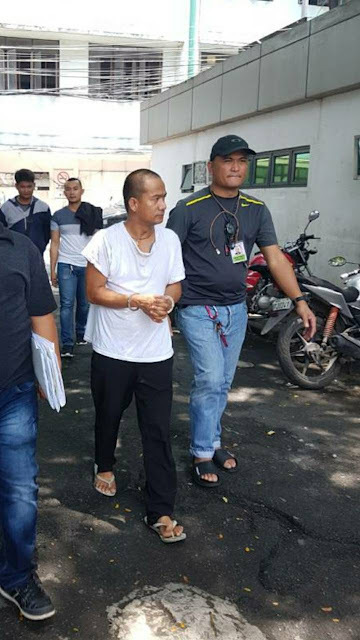 In an interview with the Philippine News Agency (PNA) Wednesday afternoon, MIAA Intelligence and Investigation Division (IID) Inspector Erick Mejia said the incident happened last Aug. 30 involving X-ray operator Nievel Gorpe. A male Taiwanese passenger sent a letter to MIAA on Aug. 31, saying USD2,600 was stolen from his bag during inspection. In his letter, the passenger claimed he had USD11,300 placed inside a brown envelope in his bag. However, when he counted his money while he was onboard the plane, it only totaled USD8,700. CCTV footage showed Gorpe placed something inside his pocket while the said passenger was not looking. Gorpe was seen with another OTS staff, Intel Agent 1 Reinielle Alvarez. In a sworn statement, Alvarez narrated that he went to the IID office last Saturday (Sept. 1) to report the incident. Gorpe allegedly gave him USD100 after their duty last Aug. 30. Alvarez said he had learned about the passenger's complaint and he was afraid he might lose his job. At around 8 p.m. on Sept. 1, Gorpe also went to the IID office. Gorpe was placed under arrest shortly after an altercation with police investigators. Wala akong pakialam sa inyo. Eh ano kung pulis kayo? Wala rin akong pakialam sa taga OTS na yan, baka s'ya ang nagnakaw at ako ang tinuro..." Gorpe was quoted yelling at airport policemen. Mejia initially filed unjust vexation charges against the suspect. Gorpe was presented before the Pasay Prosecutor's office during an inquest last Sept. 1.